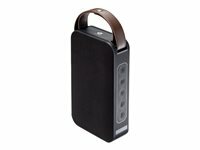 The Conceptronic Wireless Bluetooth Speaker is a Bluetooth multimedia speaker which connects to any Bluetooth phone, iPad, tablet, or laptop. The BRONE gives you more ways to enjoy music, offering USB, Micro-USB slot and AUX connections. The stylish strap and easy-carry size make it a great portable outdoor companion. Just turn it on, turn it up and get the party started!